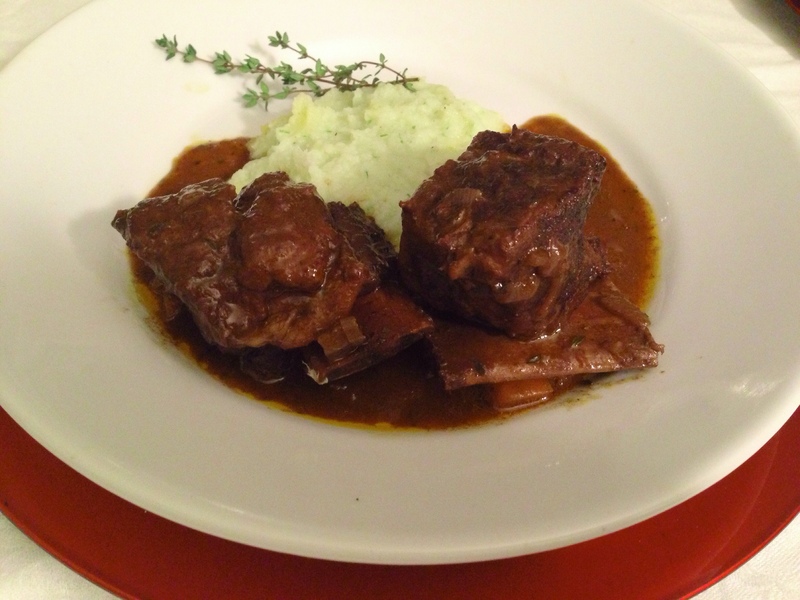 Wine Braised Short Ribs: For 15% Naughty Living! It’s winter, its cold, and you have perhaps you‘ve been focused on your New Year’s resolutions and have been dieting and exercising non-stop. If that’s the case, it may just be time for a to make something naughty! 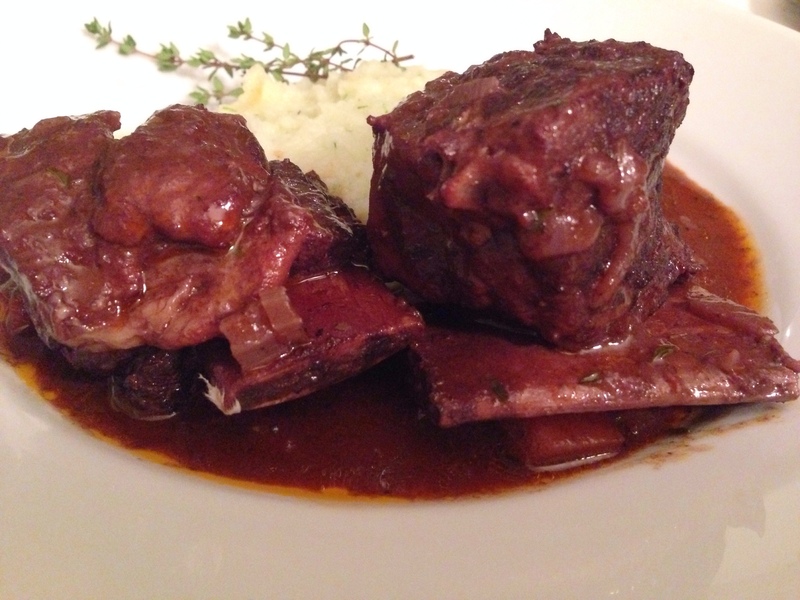 And what better way than with wine braised short ribs. There is something very decadent about short ribs and when paired with a great big red wine, this meal could set the perfect romantic stage for celebrating Valentine’s Day. To help lighten this meal up, serve it with cauliflower mash with chives… the cauliflower adds a nice lightness to the bite. When I asked the butcher for the right amount of meat for a dinner for 2, he went heavy handed, saying that if you are going to the trouble of cooking the ribs, you should definitely have leftovers. So he armed with a little less than 3 pounds of short ribs (with bone). It’s more than enough for two. In fact, this recipe works well for 4 pounds or 4 people, as long as the wine covers the meat in the pot. This recipe is pretty easy to make but you do need some time to cook the ribs so they are falling of the bone ­– and that they will do. Try to trim as much fat off the rib as possible, without taking the meat off the bone before cooking. To make this dish, I use a heavy Dutch oven. First salt and pepper the ribs the dip them in the Einkorn flour for a thin coating, then brown them in the pot on top of the stove, for a few minutes on both sides. This helps add a nice consistency to the sauce. 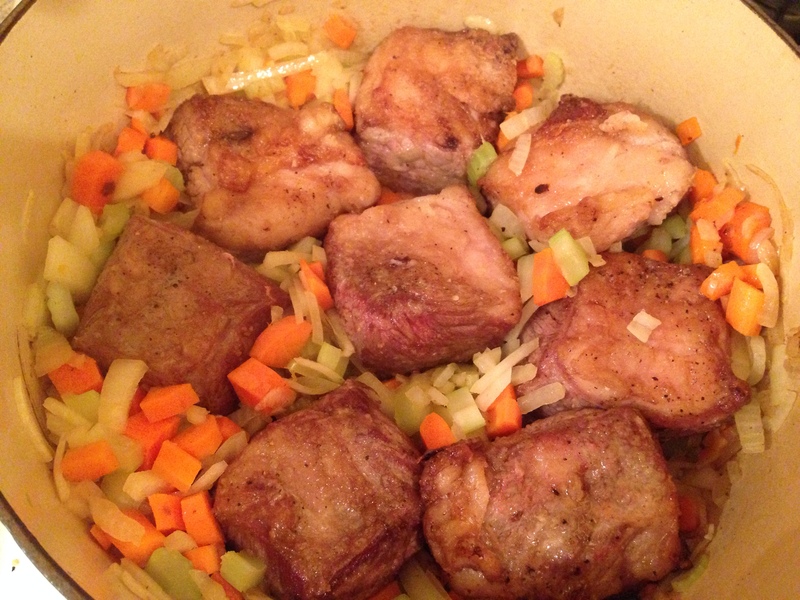 Once the ribs are browned then sauté the mirepoix (onion, carrots and celery) until they are soft. Then add the ribs back to the pot, with all the other ingredients. Cover and place in a pre-heated oven at 350° about 2.5 hours. When the ribs are done, remove the ribs and place them in another pot or a serving dish, if you are not plating the ribs, and strain the sauce over the ribs, and discard the solids. To make this dish, you first salt and pepper the ribs and dip them in the Einkorn flour for a thin coating, then brown them in the pot for a few minutes on both sides. Remove the ribs from the pot and add the mirepoix (onion, carrots and celery) and the garlic and sauté until the onions sweat and are a bit translucent. Add the ribs back to the pot, then add the wine, thyme, bay leaves, salt and tomato paste. Cover and place in 350° oven for 2.5 hours. When the ribs are done, they will be falling off the bone. Move the ribs to a new pot or serving dish and strain the sauce on top. Discard the solids. Serve with cauliflower mash with chives. Serves 2 with some leftover. 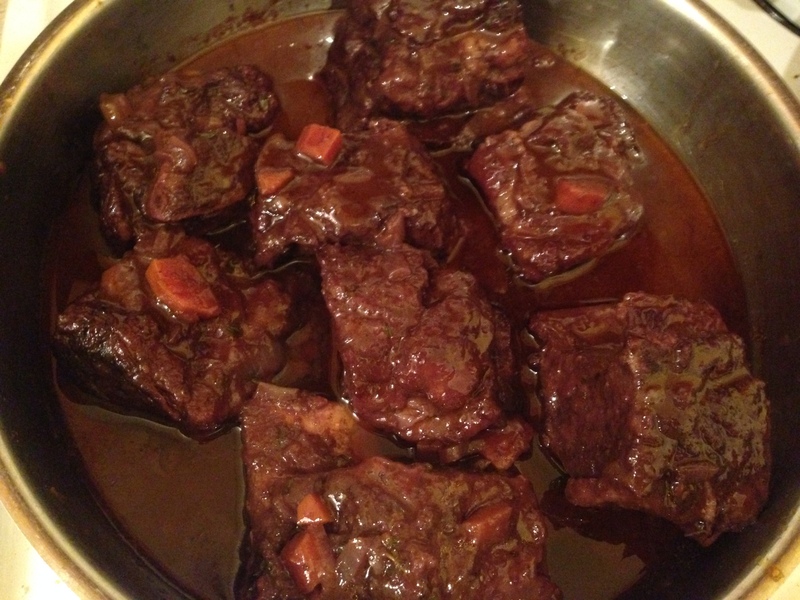 This entry was posted in Blog, Recipes and tagged short ribs, wine braised on February 1, 2014 by Leslie. Can’t wait to try this recipe! Love short ribs. The most delicious treat. I can’t wait to make them again and I will be making more than 4lbs!